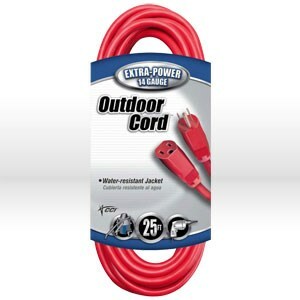 Vinyl outdoor extension cords are molded with water resistant connectors with reinforced blades resists moisture, abrasion and prolonged exposure to sunlight. Reinforced blades help prevent accidental bending or breaking. Molded plugs and heavy-duty strain relief protects electrical connections resulting in longer cord life. Outer jacket won't mark floors or walls.